Your card gives you a discount of 10% or more at a wide range of shops across London and Portsmouth. Restaurants, beauty parlours, DIY stores, furniture shops, chemists, fishmongers, greengrocers, florists, opticians, key cutters and more. 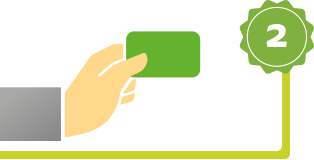 Your card shows your name but keep in mind you may also be asked for photo ID when using the card (drivers license, travel card, passport). You can find a full directory of participating businesses here. For a full list of terms and conditions click here. We think people who volunteer a lot deserve a small treat every now and then. Along with your card you get a gift voucher. Use our website to choose one of the little thank you's donated by friendly businesses. Meals, beauty treatments, paint brushes, health checks, flower bouquets, key cuttings, shirt dry cleaning-we have some great vouchers. Browse through the list of businesses here and look out for those offering a gift voucher. Choose the one you want, click on it and enter the voucher code you have been sent and your name as it appears on the card. Then print out the voucher that appears to collect your gift. You will need to use the gift voucher in the month you choose it so make sure not to forget. Expired vouchers can't be exchanged and when used once the code on the voucher is deleted and can't be used again.